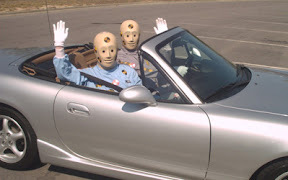 The new crash test results are out from the NHTSA. Image from Wikimedia Commons. The latest batch of crash tests by the government has just been released. The new ratings put the total number of stars up to 5. In the first round of testing, there were only two five-star vehicles. The BMW 5 series and the Hyundai Sonata were the only cars that got five stars in the tests. The initial round of testing put 34 vehicles through crash testing, including a new sliding side impact collision test. The National Highway Traffic Safety Administration changed the crash test rating system. Instead of the usual one to four star scale, it is now one to five. The first round of testing, according to USA Today, has just concluded. The first round of tests were conducted on 34 vehicles. The second round will test 22 more. Along with the new rating system, more stringent criteria are being used. There is also a new test. The new test is for a side collision while skidding. The NHTSA also tested for electronic stability control and other crash avoidance systems. The NHTSA also urges people not to compare the earlier standards to the new standards. There were only two five-star crash tested vehicles. The BMW 5 series and the Hyundai Sonata were the only cars to warrant a perfect five-star crash test. There were also only three cars that rated less than four. The Toyota Camry and Camry Hybrid were the only two vehicles to get a three-star rating. Last year, the Camry got the highest scores. The Nissan Versa received the lowest score of two. Every other vehicle tested got four out of five stars. This only the initial round of tests. There are more than 22 cars that still have to go through crash testing from the NHTSA. The entire list is available from the government at Safercar.gov for those interested in checking out the ratings before they buy.